The Hindi Belt or Hindi heartland or Hindi patti, is a linguistic region encompassing parts of northern, central, eastern and western India where Hindi (and the various languages/dialects grouped under it) are widely spoken. Hindi belt is sometimes also used to refer to nine Indian states whose official language is Hindi and have a Hindi-speaking majority, namely Bihar, Chhattisgarh, Haryana, Himachal Pradesh, Jharkhand, Madhya Pradesh, Rajasthan, Uttarakhand, Uttar Pradesh and National Capital Territory of Delhi. It is also referred as Hindi-Urdu belt by some Muslim writer. There are pending demand to include Angika, Bundeli, Bhojpuri, Chhattisgarhi, Garwali, Haryanvi, Kumaoni, Kurmali, Magahi, Nagpuri, Rajasthani language in Eighth Schedule which are considered Hindi dialect. Some academics oppose inclusion of hindi dialects in the Eighth Schedule of the Constitution as full-fledged Indian languages. According to them recogniton of hindi dialects as separate languages would deprive Hindi of millions of its speakers and eventually no hindi will left. ^ "Battle for the Hindi heartland: Will it favour the BJP again?". www.orfonline.org. ^ "Congress' revival in Hindi patti". www.nationalheraldindia.com. 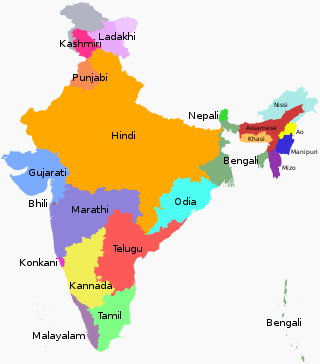 ^ "Hindi and the North-South divide". ^ "India's Evolving Linguistic Landscape". ^ "38 languages stake claim to be in Eighth schedule". www.dailyexcelsior.com. ^ "Don't add Hindi dialects in Eighth Schedule, say academics". www.thehindu.com. ^ "Linguists divided over inclusion of Bhojpuri in 8th Schedule". www.indiatoday.in.